… and the polka-dotted plus-sized women’s one-piece bathing suit didn’t help either. Some people get a lot of good breaks in life; others have to work hard for everything that comes to them. Today’s honoree is from the latter category. With all these strikes against him, he seemed like the last guy you’d expect to become a pro wrestler – a field whose job description consists of extraordinary athleticism, good microphone skills, and a looking good in spandex. But Virgil Runnels, Jr would not be deterred. He branded himself as Dusty “The American Dream” Rhodes and basically played himself en route to 10+ world championships, two consecutive PWI Wrestler of the Year awards (an award Michael Hickenbottom somehow didn’t win once), and election to the NWA and WWE Halls of Fame. 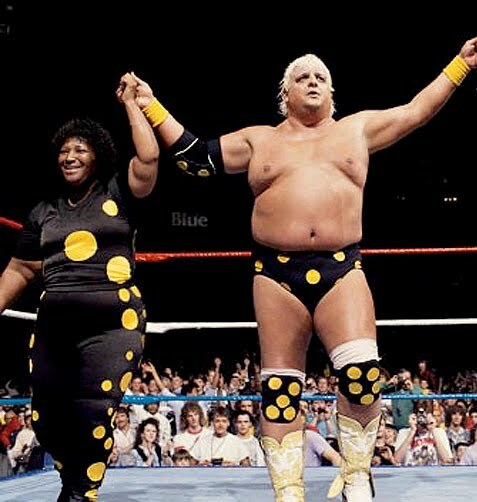 As it turned out, Dusty Rhodes had so much charisma, he didn’t need enunciation skills, or a handsome physique, or any athletic gifts. American fans associated with him, and fell in love with the character’s “son of a plumber” back story, infectious enthusiasm, and the remarkably creative lines he delivered in his trademark Texas-tinged southern jive. He became one of the sport’s stars, engaging in a marquee, long-term rivalry with the much more gifted “Nature Boy” Ric Flair during an era when wrestling grew from a series of regional promotions to a nationally-televised athletic spectacle. 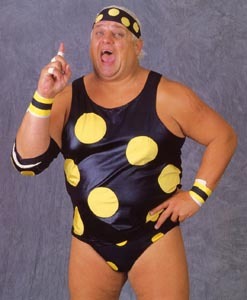 Later, they would bring in a romantic interest for Dusty: a polka dot-wearing “superfan” named Sapphire. Dusty “discovered” Sapphire when she distracted one of his opponents, allowing him to pin his opponent. After his, he invited her into the ring to join him in his post-match dance. If you feel like it, watch this short clip and tell me how you can’t love that duo? Sapphire would then serve as Dusty’s manager for two years until his 1991 retirement. He would go on to work as a promoter and event booker for WCW and then later return to WWE in a similar capacity. A few years ago, when my brother Rob turned 21, he decided he wanted to celebrate by he and I driving out to Arizona for Wrestlemania 26 (where we saw Michael Hickenbottom‘s last match). I hadn’t followed wrestling in probably a decade, so I thought the Shawn Michaels match would be my highlight of the trip…until Rob told me that there was a special event where Virgil Runnels, Jr. would be signing autographs and taking pictures. Wearing a pink collared shirt, he was just as charming, friendly and awesome in person as he is on screen. Looking back, it was one of the better moments of my life, where a California-born pre-med student got to spend a few minutes connecting with a Georgia-born son of a plumber, and reaffirm that The American Dream is alive and well. 10 Responses to Virgil Runnels, Jr.
And funky you remain, Dave. “Ever seen a dipstick babeh! ?” This quote will live forever. Welcome back Dave. Hope your exams went well! 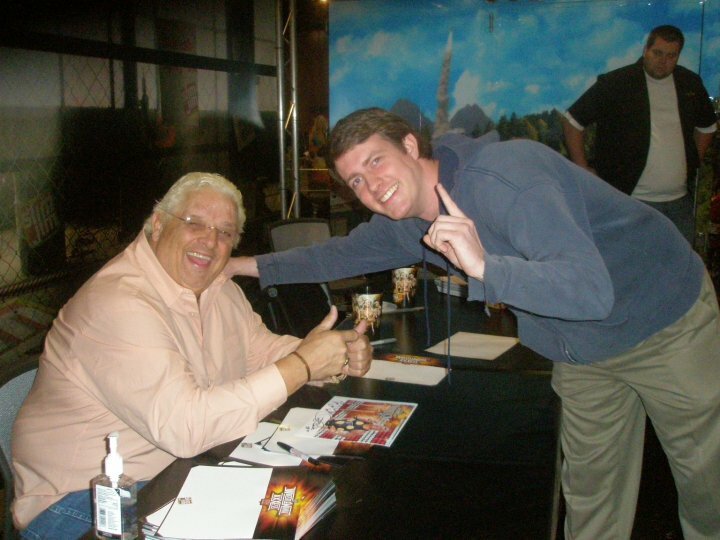 I asked hubby about this man and got a history lesson on the wrestling game at the time Dusty was in the ring. Its obvious he loves wrestling, even though he is more of an academic than redneck…well I guess he’s both! lol No offense intended to anyone reading this. I have never seen the attraction. He says it is the acrobatics and the dance. Perfect timing, perfect landings etc. So maybe it is another of the sweet sciences? I think they went pretty well! In any case, glad to be back! I haven’t been much of a wrestling fan for a while (probably a decade at least), but Rob still is – although even he admits the old days were way better than it is now, and spends a lot of time rewatching old matches. Both of us are also more academic than redneck, as well – there’s actually a surprising number of people in the “intellectual wrestling fan” category. They have entire websites devoted to people deconstructing the direction of the company, what their intentions are as far as promoting or retiring certain characters, and all sorts of interesting behind-the-scenes news. Rob is probably in the top 0.1% of well-informed wrestling fans who have never actually been a part of the industry. His level of knowledge of WWF/WWE (and the other wrestling promotions) is incredible. My take on it: I once described wrestling to someone as a “soap opera for guys” – at its best, you have people who are tremendous athletes and entertainers, and they keep it fresh with (usually) interesting storylines and bizarre characters. Dusty Rhodes/Virgil Runnels, Jr. was one of a kind, though. That man had extraordinary charisma. LOL! This is true in so many ways. Hubby’s knowledge isz also encyclopaedic. From the 50’s through to almost present day. He doesn’t enjoy it so much now. After it was announced it is indeed practised and choreographed, it lost its lustre I guess. I’m so impressed that I’m thinking of trying this fashion look of Lycra and yellow polka dots when I go on holiday!! I think they went pretty well. We’ll see. I have to wait a month until I receive the results. Unfortunately, I have another huge exam in 8 days, so it’s a busy stretch for me. I couldn’t love this post any more if it jumped off the screen and gave me a hug.